Laddus are always tempting. 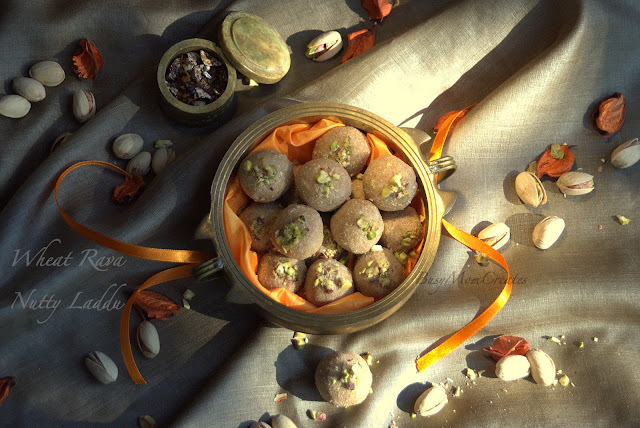 From an assortment of laddus how about we cherry-pick a healthier version that's easier and rich with flavor? 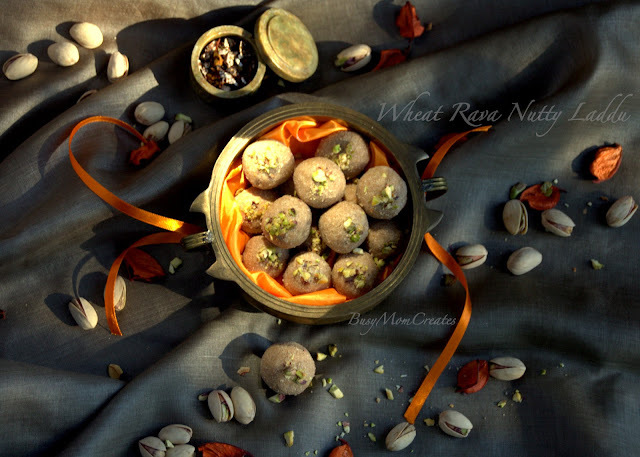 Rava laddu made with wheat and nuts can be made by anyone. Yes, a newbie to kitchen can give this recipe a try. It's that simple with very few ingredients and tastes yum! I love the texture when using wheat rava instead of the wheat flour. This recipe is perfect for a last minute sweet for any occasion! Using the same ghee left in the pan add the wheat rava and fry well for close to 10-15 mins (depending on the size of your rava) in medium-low flame. It's important to keep stirring to roast evenly and to prevent from any burns. The longer the wheat rava is fried the better for it to release the natural aroma of the wheat which accentuates the tastes. 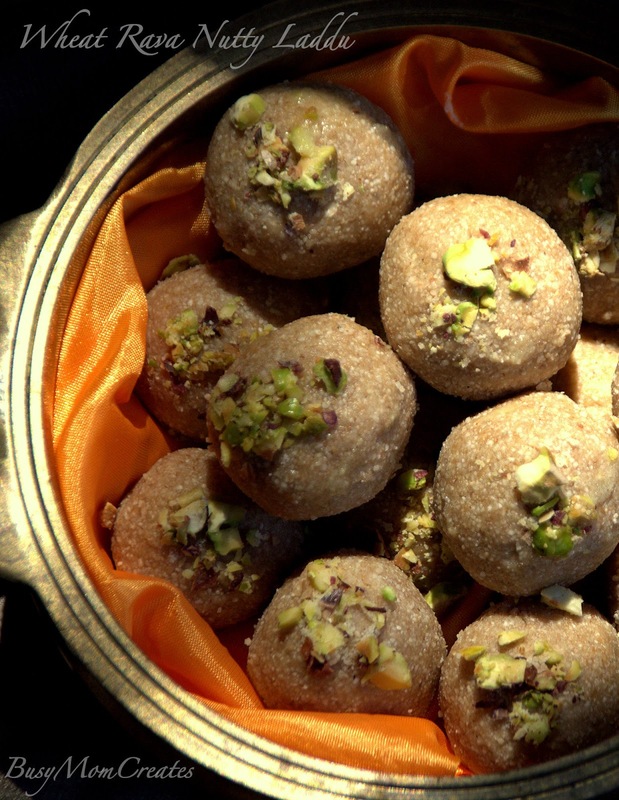 You might be interested in the following Indian sweet for this Diwali. Please click on the title for its recipe link. 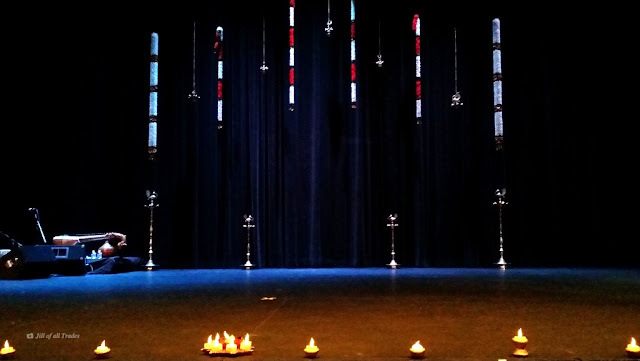 Thanks Praneeth Ankireddyapalli! Please do try and take a picture to send it across. Will post for public as "Tried and Tasted". Enjoy cooking and eating! Excellent recipe! Will read this out to my mom. I simple love the way the pictures are shot! You are becoming a pro! Looking awesome!!! Cannot wait to taste this awesome treat!!! Sorry for putting pressure, now you have to share with me!